STS-127's sixth launch attempt was successful, on July 15, 2009 at 6:03 p.m. EDT STS-127 (ISS assembly flight 2J/A) is the most recent space shuttle mission to the International Space Station (ISS). 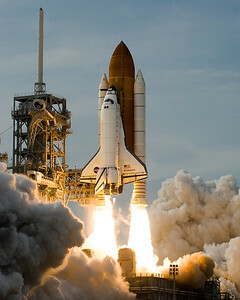 It is the twenty-third flight of Space Shuttle Endeavour. The primary purpose of the STS-127 mission was to deliver and install the final two components of the Japanese Experiment Module: the Exposed Facility (JEM EF), and the Exposed Section of the Experiment Logistics Module (ELM-ES). When Endeavour docked with ISS, it set a record for the most humans in space at the same time in the same vehicle, the first time thirteen people have been at the station at the same time. It also tied the record of thirteen people in space at any one time.